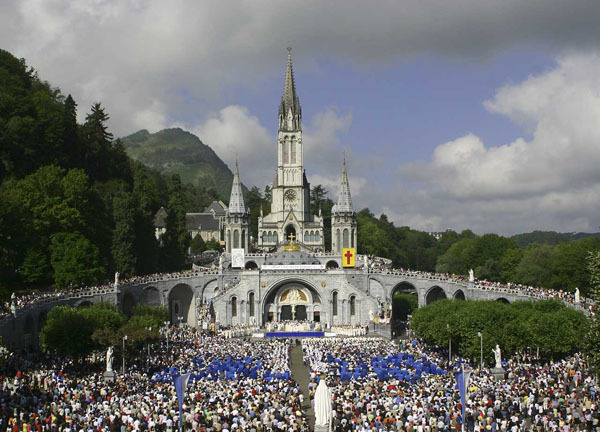 Tomorrow I am up early to do my run-walk covering all of Lourdes and documenting it for you with EveryTrail with interactive map, commentary, pictures and video. 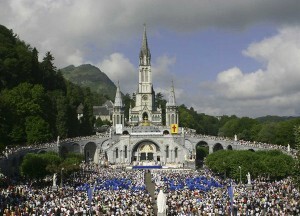 You will join a virtual early morning tour of the Lourdes visited by 5 million pilgrims a year. Then I will on Teresa Tomeo’s show at 9:20 AM Eastern to discuss Lourdes, Mary and the place of women in the Church. To listen on-line click here. Also on EWTN, Sirius Satellite and many other sources. 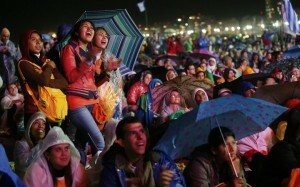 If you want to join us in Fatima and Lourdes in September, check out our pilgrimage site at http://www.footprintsofgod.com. 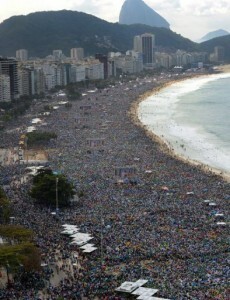 For those who thought religion was dead or the Catholic Church irrelevant: Feast your eyes on this! God is alive! These 3 million young people celebrate the fact! For over a hundred years we’ve heard the foolish obituary, “God is dead!” The Enlightenment enlightened us to this truth and told us we were alone in the Universe. No God! We men are in charge and the center of all things. We shape our destiny, we create meaning for our existence, we can rid ourselves of old-fashioned religion and squash the Catholic Church (the source of our oppression and dillusions). It was not the white haired grandmothers or the sour-faced religious types flooding the streets in numbers beyond belief – it was young people from nearly every country in the world that flocked to see the Pope and to celebrate the Catholic Faith. They pulsed with a religious fervor and enthusiasm. They ignore the foolish materialism and secularism of the elite. 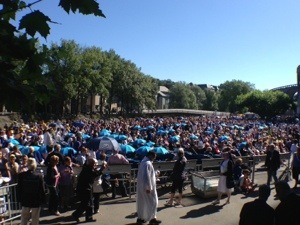 They were there to experience the living God and to hear his vicar on earth. They were there to celebrate the same Mass that had been celebrated by the Apostles and the first Christians – and done so continuously for 2,000 years. The Pope said these young people are our future. He is right. And they are right – they’ve scorned the secular ideologies and “God is dead”. They want and have found the truth. Religion is not dead. Secularism is dead. The Catholic Church is more relevant and alive today than ever. I am proud to be a Catholic! From Steve Ray in Lourdes France. I am watching thousands upon thousands of folks on the other side of the planet from Brazil, also reveling in the Faith of the Church and many of them being healed by the power of the very God who exists and is working in the world in the 21st century. Picture below taken this morning at the Grotto of Bernadette. Pope change Church Teaching on Gays and Women? The Media Seems to Think So! 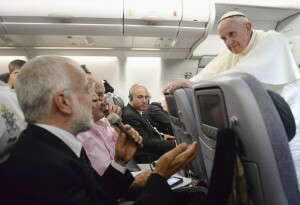 Do they really think the Pope can or will change Church teaching? Their foolish reaction and splashy headlines only prove them ignorant and incompetent. Teresa Tomeo: “Here we go again. That’s what went through my mind when I started seeing the very sensational headlines from CNN, CBS, the Daily Telegraph, the BBC and others indicating that the head of the Catholic Church is doing an about face on the core teachings concerning homosexuality and the male priesthood.